Soft-boiled eggs can be tricky to perfect on the stovetop, so use your pressure cooker instead! Using this recipe, you can get perfectly soft-cooked eggs in just a few minutes. Pour water into your pressure cooker pot. Set steamer rack over the water. Arrange eggs onto the steamer rack. Select Eggs and cook for 3 minutes on Low pressure. Plunge eggs immediately into an ice bath to cool completely, about 1 minute. As is always the case with soft-boiling eggs, you want your eggs to be a few days old to help make them easier to peel. 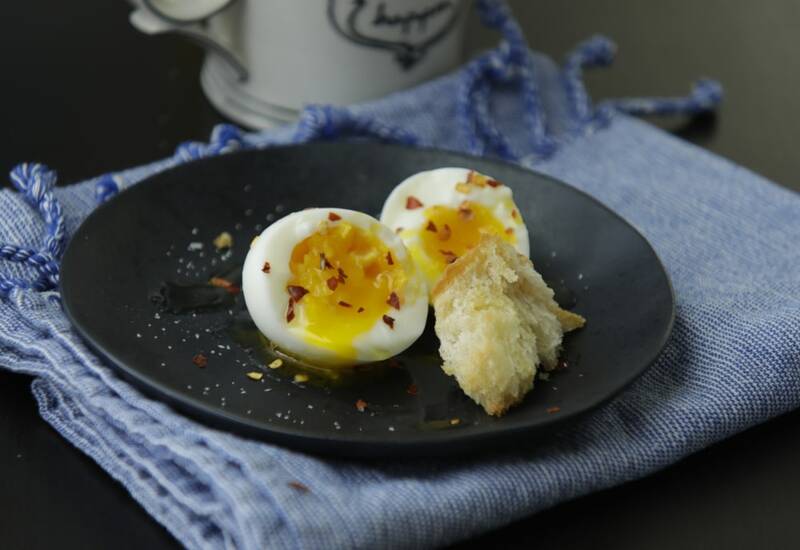 However, using your pressure cooker to get your soft-boiled eggs, will help them be easier to peel than if you simply boiled them in water, removing one of the most-frustrating elements of enjoying this high-protein snack. Per Serving: 72 calories; 5g fat; 0.4g carbohydrates; 6g protein; 186mg cholesterol; 75mg sodium. This makes the perfect soft boiled eggs. The whites are firm and yolks are creamy. Perfect, fail-proof recipe! These turned out great! I seasoned them with seaweed gomasio and they were super yummy. I made smashed avocado toast with these soft boiled eggs, yum! My new Multipot is amazing, it literally cooks these eggs to perfection. I just knew they were going to be hard boiled, but nope they had the perfect creamy yolk. I made these soft boiled eggs and "soldiers" toast for breakfast and it was so perfect. Not over or under cooked, just right. These were easy to peel and perfectly cooked! I make them all the time now, they're especially good on ramen. This was the first thing I did with my new MM and it did it wonderfully. I've wasted many a egg doing it the traditional way, not to mention the consistency wasn't near as perfect as these turned out to be. Overall cook time, start to finish, approx ~15 minutes. Excellent results, easy, and an ideal first or second choice for first time use of Mealthy Pot. This recipe produced perfectly soft-boiled eggs very easily. First time trying it. Came out a bit harder than I like but still so easy!